This Ride Notes Blog is now an Archive covering entries from June 2005 to the end of 2006. Sunday 31 December. 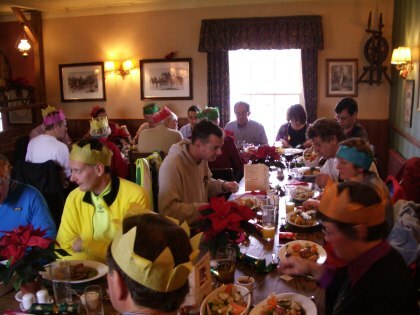 New Years Eve Ride to the Black Horse Amberley. We met for a late 10.30 start at Walberton. Myself, Sam, Harvey and Keith Dodman. The skies were heavy with thick black clouds threatening rain but luckily none arrived. We took a direct route via Madehurst to stop for elevenses at Whiteways. Then down Bury Hill and across to Houghton where Sam stopped to mend a puncture. We arrived at the Black Horse a few minutes after 12.00 at the same time as some Arun Adur members with more arriving later. Tom and Joy arrived by car to join us. After lunch Sam, Harvey and I took a direct route back riding into a strong headwind. My mileage for the day was 35. Sunday 17 December. Tinsel Ride to East Ashling. I led this ride and I was joined at the Cross by Mike, Richard, Sam, Christine and Avryl. We had a total of 13 out during the day with Alan and Liz, Dave and Jan, Harvey, Adrian and Keith Dodman joining us at the Pub. Weather was beautiful with crisp clear blue skies all day, light winds and temperatures up to about 9C. 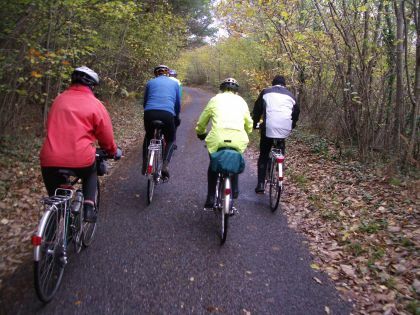 We headed out on Clay lane and the South Coast Cycle Route west to Stansted Garden Centre Cafe for elevenses. We met here a group out from Bognor CC, a Time Trialling Race Club I belong to who were on their morning Club Ride. 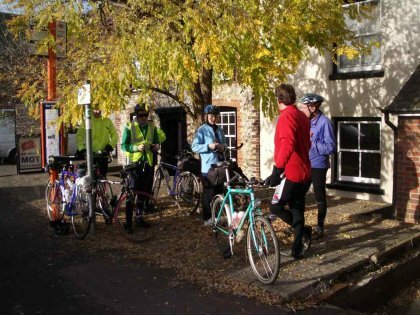 Richard went back early and the rest of us headed for lunch at East Ashling via Racton and Funtington. As we climbed the hill from Racton 2 Santa Clauses on Tricycles came down the hill, honest! Later another 3 came towards us but I couldn’t get the Camera out in time. From the top of the hill we could see a big group, maybe 20, red coated cyclists heading up the valley in the Compton direction, all were on wheels not sleighs! We headed on towards West Stoke and then down to East Ashling and the Horse and Groom for lunch. Adrian and Harvey were already there and the rest trickled in over time. Harvey was awarded the prize of a set of bike lights for the best decorated bike. 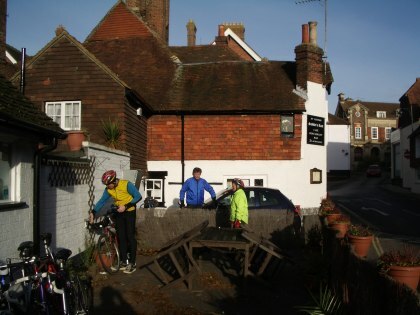 For tea we all headed over to Hillier’s near Bosham via West Ashling, probably less than 3 miles and well up on Wednesday ride standards. They did have lots of Apple Pie left which was the main objective. After tea we headed back to Chichester and then home by various routes. For me 39 miles for the day. Sunday 10 December. Christmas Lunch rides. There were 2 rides today a short one led by Richard and an alternative long fast ride led by me and billed an Appetite Improver Ride. We met 8.15 at the Cross with the sun just rising and a thick carpet of frost on the ground. I was joined by Sam and Phil and Mary. Weather was bright clear and sunny in the morning starting very cold with a temperature of zero and rising to 9C later in the day. Rain came in later but not until late afternoon. We took the opportunity of light early traffic to ride up the main road to Singleton and then along the valley via East Dean. Then down Duncton Hill and backroads up to Petworth. There were patches of thin ice on puddles in places but luckily temperatures were not quite low enough for anything slippery. We reached Petworth at 9.50 and with Tiffins closed till 11.00 we went to the old timbered café of Saddlers Rest which opens at 9.00. 2 cyclists from Guildford were already there and 7 Worthing Excelsior rides arrived later. We headed back on the same route with a stiff climb up Duncton Hill and then via Eartham and Oving to the Walnut Tree, Runcton for the Christmas Lunch. 22 attended the lunch and the appetite was well and truly satisfied after the 3rd course. I headed directly back home after lunch only catching the beginning of some light rain. 46 miles for the day. Sunday 10 December. Leaving Petworth Cafe. Bosham for elevenses where I met up with Keith and Avril. we made our own ways home. My mileage for the day was 49km. Sunday 26 November. 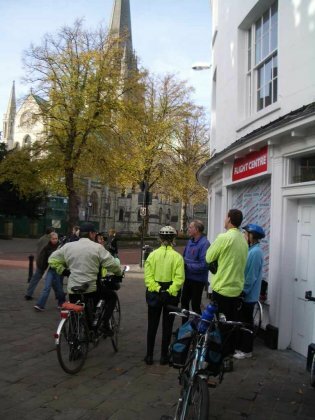 Ride from Chichester Cross to Arundel. Today’s ride was nominate Leader on the day and I was elected. 4 more joined me at the Cross, Avryl, Harvey, Adrian and Richard. The Cross itself was taped off with many Rotary Club members busy putting up the Christmas Tree and its lights. Rain was forecast for the middle of the day but in the end none arrived and a cloudy morning gave way to a bright and sunny afternoon and very mild with temperatures up to 15C. 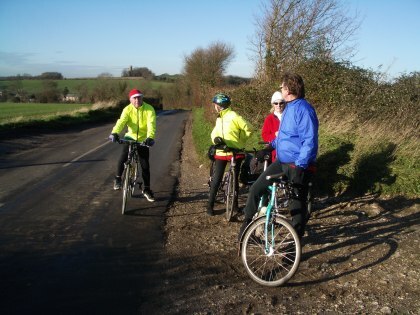 We rode via Westhampnett and back roads to Halnacker and then across to the Eartham road and down to Aldingbourne for elevenses. We were joined here by Alan and Liz. Despite the heavy rain overnight we decided to risk the track through Binsted woods. This has the advantage of very quiet backroads either side of the track. 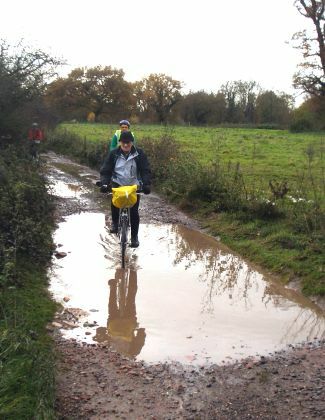 When we reached it the stony base prevented much mud but some parts were more puddles than track. We continued on quiet roads through the golden colours of the woods and then through estates to Arundel. We had lunch at the Tudor Rose Cafe. The afternoon ride took us down a very quiet Ford Road the reason for which turned out to be the crossing being closed for engineering works and all traffic being diverted. We got round this by using the underpass at the Station. Richard and I stopped for tea at Alan and Liz’s. I got back home just as the sun was setting below a red streaked sky. For me 38 miles for the day.